Why Do People Use Cranberry? 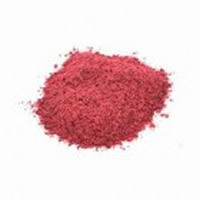 Oral preparations of Vaccinium macrocarpon (Cranberry), like cranberry powder, is used to treat and prevent urinary tract infections, as a urinary deodorizer for people with incontinence, neurogenic bladder, to heal skin around urostomy stomas and prevention of urinary catheter blockage. It is also used for type 2 diabetes, scurvy, chronic fatigue syndrome (CFS), as a diuretic, pleurisy, antipyretic, antiseptic and for cancer. In Foods - Cranberry fruit is used in jelly, fruit juice and sauce. Likely Safe - Oral and appropriate consumption of cranberry is thought to be safe. Cranberry extracts and juice have been safely used in clinical trials. Likely Safe for Children - Oral consumption of cranberry juice is reported safe to use for children. Avoid in Pregnancy and Lactation - Doctors do not advise to therapeutic usage of cranberry powder for pregnant and breastfeeding females because there is no reliable information available to rate its effectiveness. The most effective part of Vaccinium macrocarpon is fruit. The fruit part of cranberry consists of almost 90% water. Cranberry also contains ellagitannins, anthocyanidins, flavonols, for example, kaempferol, quercetin, quinic, catechins, citrus acid and malic. Other constituents include ascorbic acid, beta-carotene, chlorogenic acid, glutathione, glucose, fructose, and alpha-tocopherol. Cranberry is acidic in nature; however it does not acidify the urine as previously thought. Cranberries contain proanthocyanidins, also called consolidated tannins, and a high-molecular weight compound that has not yet been recognized. These constituents appear to meddle with bacterial adherence to the urinary tract epithelial cells. For instance, proanthocyanidins appear to be fit for "wrapping" around Escherichia coli (E. coli), which is the reason for most urinary tract infections (UTIs) and protecting it from adhering to the urinary tract wall. It possibly also has this impact against other urinary tract pathogens. However, cranberry does not appear to be able to discharge bacteria that are already stuck to the urinary tract epithelial cells. Research experiments suggest that fructose in cranberries may likewise add to the anti-infective action. Cranberry juice has antibacterial action in culture medium against Klebsiella pneumoniae, E. coli, Staphylococcus aureus, Proteus mirabilis and Pseudomonas aeruginosa. Whether the concentration of urinary of the active constituents achieve bactericidal levels is at present a point of examination. What Are The Side Effects /Adverse Reactions of Cranberry? There is no serve side effect reported due to oral the consumption of cranberry powder. But in excessive dosage i.e., 3 to 4 L per day of juice, cranberry can lead to diarrhea and gastrointestinal upset. Vomiting, nausea and diarrhea have also been reported with consumption of lower doses of cranberry cocktail juice, 16 oz. every day which is equivalent to about 4 oz. cranberry juice for number of weeks in pregnant females. Oral consumption of cranberry more than 1 L per day over extended time period may also enhance the risk of uric acid kidney stone formation. How Cranberry Interacts With Other Herbs and Supplements? How Cranberry Interacts With Drugs? How Cranberry Interacts With Foods? How Cranberry Interacts With Lab Tests? How Cranberry Interacts With Diseases and Conditions? What Should Be the Dose/Administration of Cranberry? ORAL In order to protect from urinary tract infections (UTIs), juice of cranberry cocktail (Ocean Spray), giving 26% concentrated cranberry juice should be consumed daily in a range of 300 to 480 mL (which made 10-16 ounces). Juice of cranberry can also be used on daily basis between 30-300 mL, Specific multi ingredient mixture of cranberry juice and alpine cranberry juice 50 mL ever day has also been used. Condensed preparation of dried cranberry has also been effective in doses of 400 mg - 500 mg, used twice daily. Particular extract formed by the cranberry capsule (Cran-Max, Proprietary Nutritionals) should be consumed daily in a dosage of 500 mg and 800 mg per day. In order to cure benign prostatic hyperplasia (BPH) lower urinary tract symptoms, 500 mg of dried cranberry should be consumed thrice daily for six months. In order to use cranberry as urinary deodorizer for incontinent suffering patients, 90 to 180 mL of cranberry juice cocktail (whoch 3-6 ounces) should be used daily. Cranberry is a small evergreen shrub grown throughout North America. About 1L of juice could be obtain by 1500 grams of fresh fruit. Cranberry juice cocktail is approximately 26% - 33% pure cranberry juice, sweetened with artificial or fructose sweetener.